Apple is expected to launch three new iPhone models this year, two iterative updates with similar industrial designs to iPhone 7 and iPhone 7 Plus, and one major radical new phone tentatively dubbed ‘iPhone 8’. 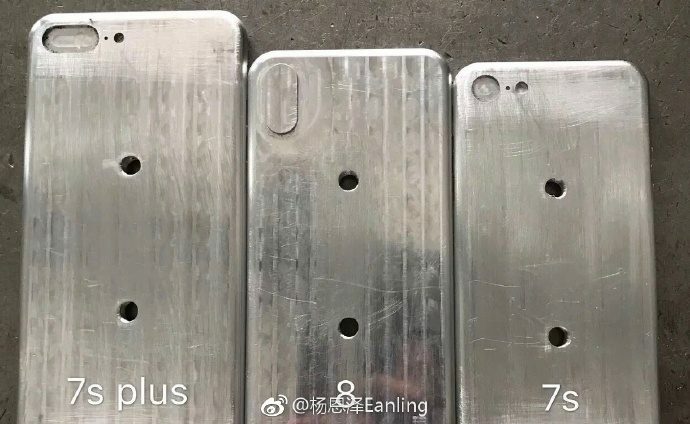 A new set of photos have surfaced on Weibo purporting to show molds for all three of the new phones. They don’t really reveal anything what we haven’t seen rumored before, but it’s interesting to see the new size in context. As reported before, the iPhone 8 — pictured middle — is much closer to the 4.7-inch iPhone 7 chassis size than the 5.5-inch iPhone 7 Plus. Despite the similar physical dimensions, the iPhone 8 is expected to feature a 5.8-inch display thanks to dramatically smaller bezels horizontally and vertically. From the new photos, it seems the iPhone 8 is marginally taller and a fraction wider than the iPhone 7. The molds include cutouts for the rear camera. Again matching previous leaks, the iPhone 8 mold shows a vertical camera module. Other schematics indicate that this single bulge will contain two camera sensors and the flash. Apple likely had to reorient the dual-camera system from horizontal to vertical due to the drastic reduction in chassis width. Apple is expected to unveil the iPhone 7s, 7s Plus and iPhone 8 in the fall at a media event in September. All three phones should feature wireless inductive charging capabilities. The iPhone 8 may go on sale later (October) than the modest iterative devices and is expected to carry a significantly-higher premium price tag.